Bad news today ! Be prepared for a big whine. I've got my first ever running injury. After last week's 25k long run (which was part of my marathon training), I realized that I was limping and that I had pains in my left thigh that were beyond the usual aches after a long run. Two days later it was still not better, and I tried a little self diagnosis by looking up the symptoms on the Internet. Everything pointed to a grade I muscle tear. Next and most important question was: How long does it take to heal and how long am I not able to run? The timing could not have been any worse. The most popular Dubai half marathon is coming up in one (!) week. I am also in the most crucial part of marathon training for the Dubai Marathon at the end of January. Damn! It's hard to sit still and do nothing, apart from rubbing tiger balm on my leg and massaging it with a rolling pin. I've got stuff to do, races to run, mileage to get in. It's the wrongest time in the season to have an injury!! After 4-5 days, I was slightly deluded when I was able to walk without a limp and the thigh not being as sensitive to touch. But my follow-up appointment with the doctor this morning left me with a less optimistic outlook. It showed that the muscle is far from healed and still very sore when pressing on the injured spots. I am now allowed a 5 minute jog. That's not even worth the effort of putting my trainers on. I don't know what to do about this. I have never been injured. Right now, I feel I have to decide which race is more important to me: the half marathon next week or the full marathon in January. If I run the half next week, I might risk not even finishing it and extended injury that will keep me from preparing for the full marathon. If I give it a miss, I will miss out on the biggest Dubai running event. But I might be able to recover properly and be ready to train properly for the full marathon. What do I want? I don't know. I still want both! I have been giving my diet extra care in the past week, making sure I eat a lot of anti-inflammatory foods to support recovery. I sprinkled in turmeric and cumin wherever I could. The veggies couldn't be green enough and raw ginger was a must in all dressings. I also allowed myself a very anti-anti-inflammatory glass of wine in the evening. To mend my broken spirits. With temporary but reasonable results. Today's Asian broccoli salad has been on my a few times in the past week. Full of anti-inflammatory ingredients, light, and good to keep in the fridge for a few hours. A true keeper that I will sure eat, even without injury. Wish me luck that this muscle tear is healing up quickly. I'd be devastated if it keeps me from running for much longer. Steam the broccoli until just tender, about 4-5 minutes. Transfer broccoli to a bowl of ice cold water to stop cooking process. Drain and set aside. In a small pan, heat one teaspoon of sesame oil. Fry the almonds, stirring frequently until nuts are toasted, 3-4 minutes. Add 1 teaspoon of soy sauce to the pan and stir until nuts are just coated. Remove from heat and let cool. In a small bowl, whisk together sesame oil, soy sauce, rice vinegar and honey. Stir in garlic, ginger and chili flakes. 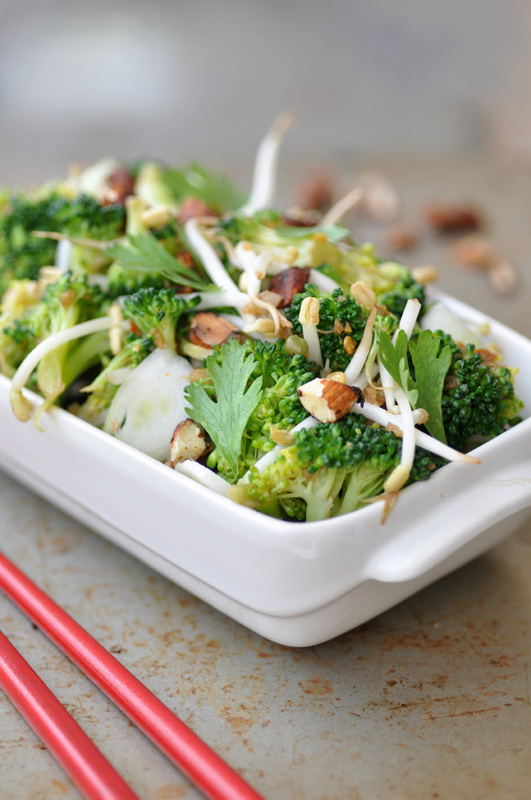 Combine cooked broccoli, bean sprouts, spring onions and cilantro in a serving bowl. Pour over the dressing and stir until evenly coated. Sprinkle with toasted almonds. Serve immediately or keep in the fridge for up to 4 hours before serving.